Heart & Mind: If that's not love, what is? Have you seen “Fiddler on the Roof”? The other night we went to a production of “Fiddler on the Roof” put on by a group of young people, including a young woman in our church family. As I contemplated what to write in this “email of God’s love,” I thought of the song Golde and Tevye sing, “Do You Love Me?” How does this simple humorous song apply to God’s love? If you are familiar with the story, you know that Golde and Tevye are a married couple with 5 daughters living in a Jewish village in Russia during the time leading up to the downfall of tsars. In their tradition (another powerful theme in the play! ), marriages are arranged by parents, along with the help of a matchmaker. 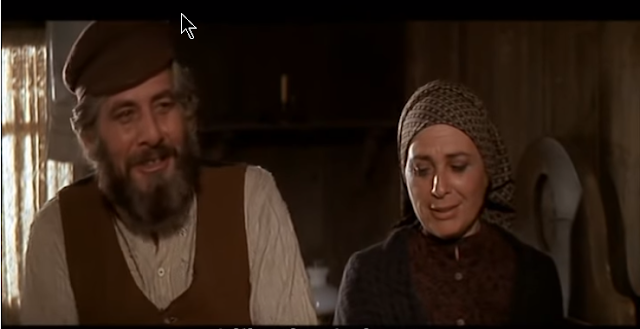 In the song, Tevye says that the first time he and Golde met was on their wedding day and his parents said they would grow to love each other. Now, 25 years later, he wonders if that is true. Golde and Tevye have been together 25 years without even thinking about whether they love each other. In the song, Golde lists many things she has done for Tevye over the years -- the actions, not the feelings. Then she says, “If that’s not love, what is?” What she does is love, sometimes in spite of her feelings of exasperation, impatience, and disagreement with Tevye -- which we see throughout the play. So actions are love. What are the actions that show God’s love? Many things come to mind: his creation of the world and giving it to us humans to care for; his gift of his son Jesus; his gift of the Holy Spirit to fill us with his love and make us able to show his love to others; the loving people he has given us who care for us; the many marvels and miracles of what we learn in science, literature, physics, philosophy; and so much more. Through the actions of others -- whether they are aware of it or not -- we receive God’s love. Through our own actions we show God’s love.